We wanted the playhouse to be something kids not only play in, but on, under, and around as well. It has the elements of a house, but isn’t. It has the materials of a pirate ship, without the scurvy crew. And it has the protection of a fort, but can be invaded by Mom when it’s time for dinner. The simple, yet versatile design of the SlatHouse allows for the child’s imagination to fill the voids, creating infinite opportunities for play. The flexibility of the fabric adds another element to the otherwise static enclosure of the frame. On a daily basis, or as a child ages, the playhouse may take on new forms and new uses by simply “dressing” it in a new way. The durable fabric can provide protection from rain, a drawing surface for washable markers, or a picnic blanket when laid on the grass. Keeping the material palette simple is something Spillman Farmer prides itself on, and being able to do more with less is a valuable lesson to teach children of all ages. The wood is thermally modified yellow pine – a common material for outdoor use because of its resistance to rot and insect damage. No chemicals are used in the process, making the wood safe to touch, smell, and for some kids, even taste. The fabric pieces are heavy-duty vinyl that will provide a bright color and durability that will withstand harsh winters and destructive children, alike. Our hope is that children will use the SlatHouse in ways we (as adult designers who know what a house “should” look like) cannot imagine. 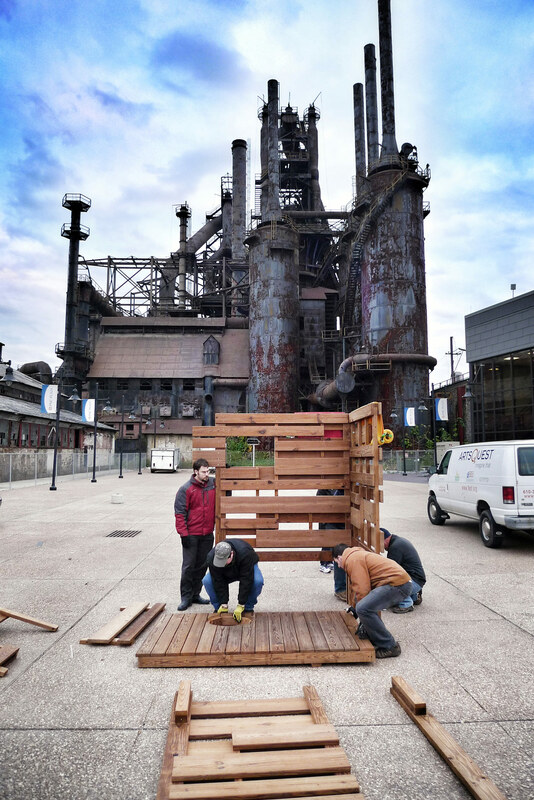 SlatHouse is on display at Christkindlmarkt in Bethlehem starting today! Head over before December 22 to bid for a chance to take this playhouse home. All proceeds from the auction benefit the Pediatric Cancer Foundation of the Lehigh Valley.